‘Cross Season Opens with a Bang! A glorious day produced a very good start to the “real” season at the Buffalo Bill CX in Leavenworth, KS on September 21 for Big D Cycling sponsored by Keen Wealth Advisors with 6 podium finishers! The course favored those who could climb and didn’t mind letting it go on the downhills, as this course either went up or went down. Not a technically demanding course but it certainly challenged the rider physically. 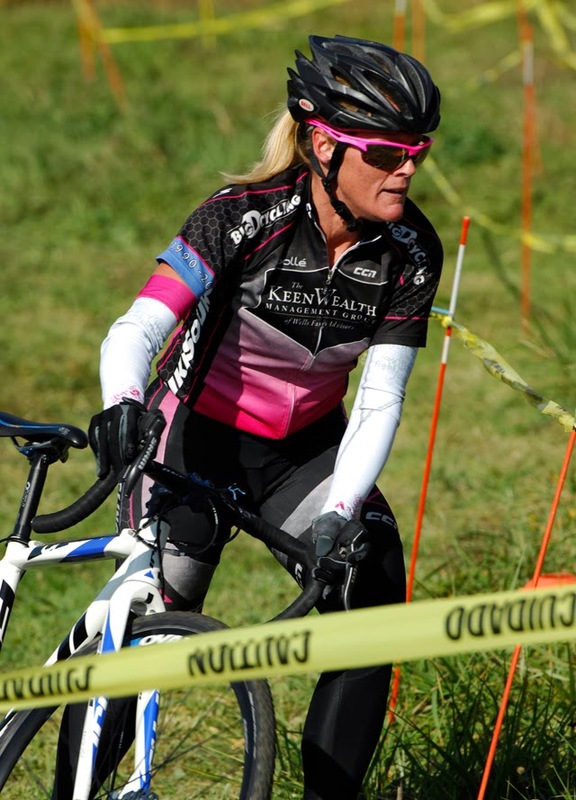 Amy VanNieuwenhuyse simply rocked in her maiden cross race! A scant three weeks ago she wore a “scared face” to our first practice. 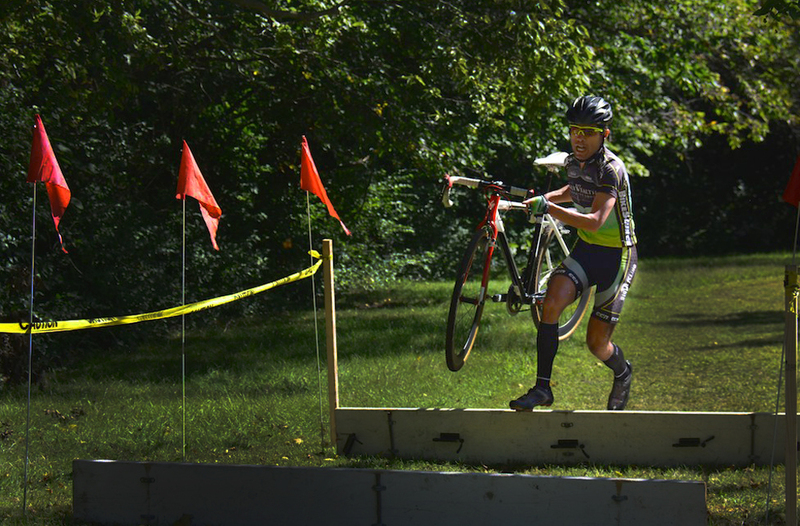 On Sunday, she not only completed her first cross race, she did it with a very impressive 2nd place. She looked controlled and kept the power to the pedals. Who knows what she can accomplish with some real cyclocross tires (this is a not so subtle hint to her husband/mechanic)? Steve VanNieuwenhuyse, known to the Big D Crossers as “Hands” for habit of placing his hands on other riders in tight quarters, rode to a solid 5th place in a Cat. 5 field that included two riders that should be Cat. 3’s if not Cat. 2’s. Steve has been a super quick learner. His superior handling skills, tidy barrier work and his aggressive style will have him placing well in the 40+ category starting this weekend. Tim Herre must have been super excited about the start of the season because he raced twice! In the single-speed battle, he placed very impressive 2nd place and followed it up with a 6th in the Cat.3’s after recently upgrading. Congrats Tim your fitness is paying dividends! And the old dudes represented Big D Cycling and Keen Wealth Advisors in solid fashion! Lead by youngster Paul “Sox” Aldegeur with a 2nd in the 40+ field. His road fitness certainly was on display on Sunday! The 50+ field had three Greenback riders with Jim Clevenger in 2nd, Greg “Sly” Vaught in 6th and Chip “CZ” Zimmer in 9th. Sly suffered with a shifting problem, but stayed tough. CZ had a strong showing after suffering from a battle with an Achilles problem for a year. Like Hands, he has been a quick learner with strong overall fitness and solid handling skills. Bill Jennings and Frank “Q” Quinlan our 65+ studs, pocketed 2nd and 3rd places respectively. Q did a solid job but needed some different gearing to better negotiate the hills of Leavenworth. These two super-masters are looking to have a great CX season. Special thanks as always to Roger Harrison of Lanterne Rouge for providing the photo for this post. See more images from Buffalo Bill ‘Cross here. Our intrepid ‘cross riders have been busy this Fall with great results in November, and leading up to some podium spots at States in early December. Tim Herre put a cherry on the top of a great season so far with a silver medal in the Cat4 race. The course was slippery with a blanket of snow and ice which was steadily falling all day. William Jennings was first in the superMasters 70+, and seems to be having the most fun of all his CX teammates. 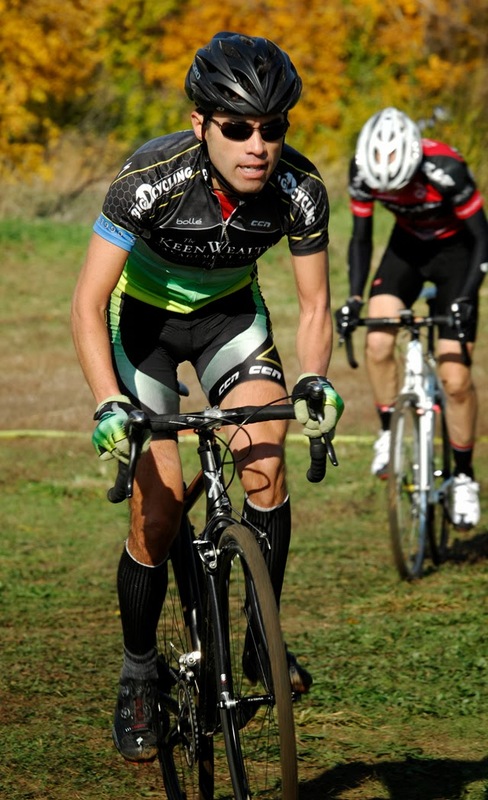 Greg Vaught came through in the Master 50+ event with a fourth place finish, and has been steadily getting better at cyclocross in his first season. Earlier on the calendar Old Spice took a sixth at Lost Trail CX in Louisburg. At Boulevard Cross in November Jim Clevenger was edged out for a podium nod by his teammate, Paul Fancher, who got the third step. Lynn Wilson has been on the podium as well, grabbing top spots in just about every race she enters. Special thanks to our title sponsor Keen Wealth Advisors. Although not usually a dominant team in cyclocross, Big D has really made a name for themselves in the discipline this year. At Manions Cross, Jim Clevenger got 3rd and 6th in the 50+ races. Paul Aldeguer got 4th and 7th in 40+. These two cross veterans are leading the way for the team, and offering tips to their teammates new to CX. Also at Manions, Chip Zimmer came in 10th in his debut and Time Herre got 7th in Cat4 racing. 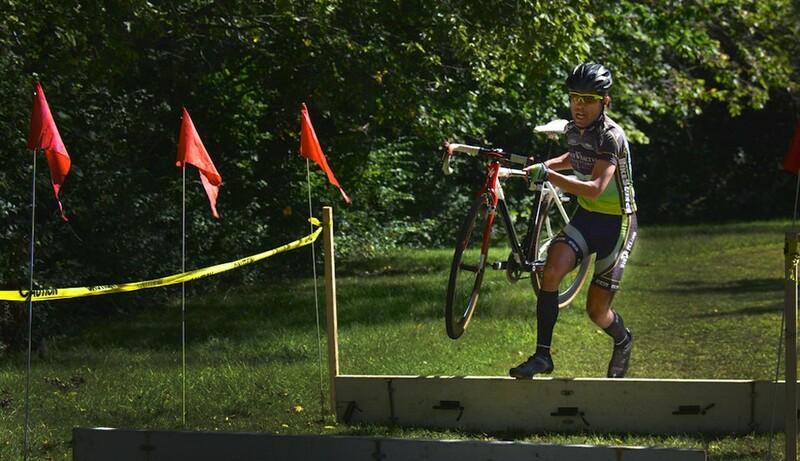 Joules Cross in Lawrence saw the return of vet Paul Fancher who came up with a podium spot. Aldeguer grabbed 3rd and a top ten for the weekend and Clevenger looked good with a 1st and 2nd place for the series. Look out for Chip Zimmer and Greg Vaught, who have been doing well in masters racing. Lynn Wilson also turned in an impressive result in one of her last few races in pink with a 2nd place finish. On Saturday, August 24, Big D Cycling sponsored by Keen Wealth Advisors and the great mechanics from Bike Source participated in the annual Shawnee Rotary Club Bike Rodeo. More than 300 grade school children were fitted with new helmets, had their bikes checked, tires inflated and seats adjusted. This has become an annual charity event for Big D Cycling with many members of the team donating their time and energy to insure the children of our community are cycling safely. At the Tour of Lawrence the Cat4 KBAR race came down to the last races of the series, with Joe “Mongo” Kleidosty neck and neck with Local’s Vince Delaughder and Travis Tesone of MMC. It came down to a few points between them so a good result by any would have made all the difference. In Saturday’s very technical road race, Mongo lost a bottle and had some mechanical issues which kept him out of the points. Tesone had a decent result in the Crit the following day, which left our power four out in the cold. Kurt Wilson placed 4th in the road race, Donavon Hottman grabbed 8th and then 9th the following day in the 60+ races , while teammate Bill Mason snatched a top ten spot in the crit. Lynn Wilson took 6th in the open women’s RR as Rochelle Scleicher took 1st in the RR and 4th in the crit. Schleicher was dominant throughout the KBAR season and it wasn’t even close for her as she sewed up the contest long before ToL. We had some great results from our Masters at a watered-down Sunflower Games, but the big highlight was Noah Collins who took podium spots each day and walked away with the omnium title in the Cat4. Collins has a great career ahead of him, and should be looking good next season as a young Cat4. The State Line RR was one of the season’s most miserable events, plagued by a chilly downpour but Paul Aldeguer finished 3rd in the masters while Rochelle Schleicher came in 7th n the women’s open. 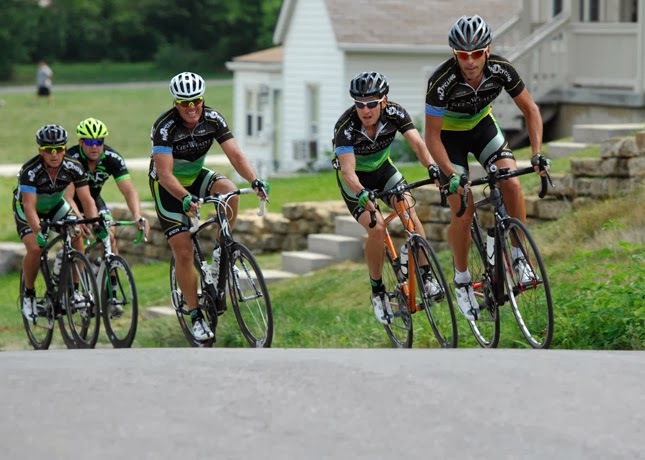 A new event on the calendar this year was the Cathedral Criterium held in Kansas City Kansas. It was a crit-heavy season and the sprinters enjoyed having a lot to choose from. On day one Shawn Knight and Kurt Wilson took 2nd and 5th in the 4/5 race and Kurt followed up the next day with a 9th place, with Knight coming in right behind him. Schleicher took first ahead of Lynn Wilson’s 2nd in the 3/4. Wilson got two more second places the next day and Rochelle got two fourth places. At the team co-sponsored Buffalo Bill Criterium in September, Noah Collins came in third in Cat4 with the help of super-domestiques Kurt and Shawn. In the 40+ race Kurt took 1st and Shawn came in 4th. The 50+ race had Jim Clevenger coming in 1st, Ron Marney 2nd, Greg Vaught 3rd. Stephen Whalen got 6th. Frank Quinlan was 2nd in the 60+. Lynn Wilson and Rochelle Schleicher grabbed top spots in the open and Cat4 women’s races respectively.